The Rafflesia, a parasitic plant, lives only on the tetrastigma vine in the jungles of Sumatra and Borneo. 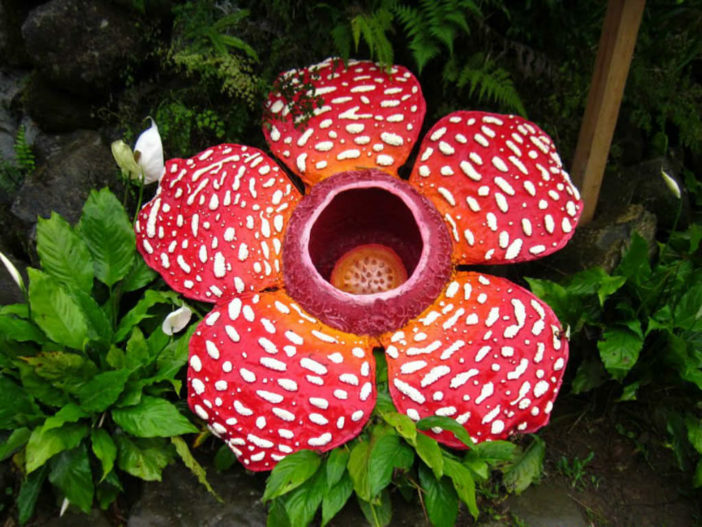 It produces the world’s largest flower, which measures up to 3 feet (90 cm) across and weighs 15 pounds (6.8 kg), according to the Library of Congress. Approximately 17 species of Rafflesia exist. It produces no roots, stems or leaves. Pollination is rare because most locations contain only male flowers or female flowers. In order for pollination to occur, the fly must land on the male flower and then take the pollen to the female flower. If pollination occurs, the flower produces a globular, smooth-skinned fruit measuring up to 5 inches (13 cm) in diameter. It contains thousands of seeds. Birds and squirrels enjoy eating the fruit and help to spread the Rafflesia seeds through their eliminations.